Jordan Morton write about the experiences within the crossadaptive project in her master thesis at the University of California San Diego. The title of the thesis is “Composing A Creative Practice: Collaborative Methodologies and Sonic Self-Inquiry In The Expansion Of Form Through Song”. Jordan was one of the performers that took part in several sessions, experiments and productions. Her master thesis give a valuable report of how the collaboration was experienced by her, and how it contributed to some new directions of inquiry within the practical part of her master. We presented the project during the Artistic Reaearch Forum in Bergen on September 24th 2018. 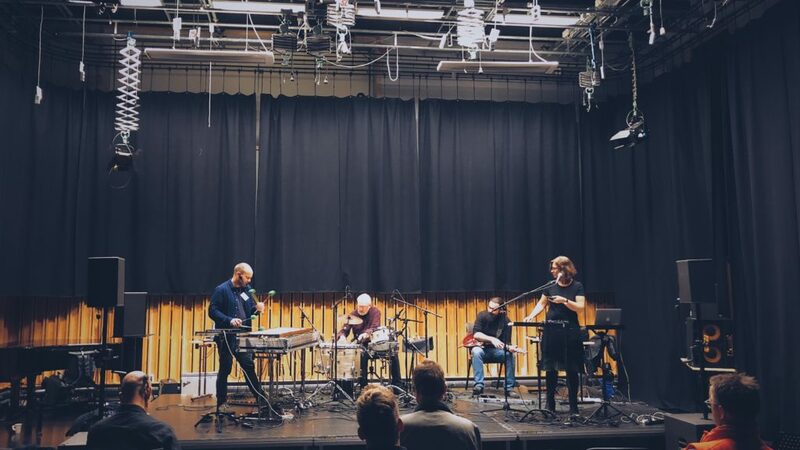 The presentation consisted of a short introduction of the concept, tools and methodologies followed by a 20 minute musical performance showing several of the crossadaptive techniques in an improvised context. The performance was followed by a commentary by Diemo Schwarz and concluded with a plenary discussion. Crossadaptive performance at ARF in Bergen. Left to right: Oeyvind Brandtsegg, Carl Haakon Waadeland, Trond Engum and Tone Åse. Photo by Stian Westerhus.